DG MILLY DON'T shoot is a large bodied black and white cow, that is a granddaughter of MAXIMUS ST. She has a great pedigree, top and bottom. MILLY is out of Gwen Damatto's breeding program. Her heifers are always the biggest in the pasture. 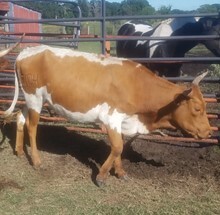 Confirmed pregnant to CV COWBOY CASANOVA by blood draw on 09/03/18. MILLY has had a heifer on 04/15/2015, 05/15/2016, 06/14/2017 and 05/08/2018! 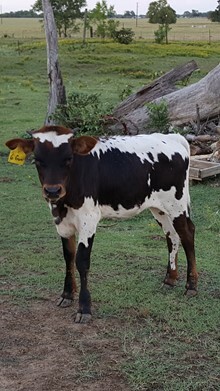 We are really hoping for a CV COWBOY CASSANOVA HEIFER! Don't pass up on this cow, she always out produces herself! 7/20/18 to 8/4/18 AI'd to Cowboy Casanova. She was confirmed pregnant, by blood draw on 09/11/18.